The second year of the return of rodeo to Pahrump Valley High School could be twice as good as the first. 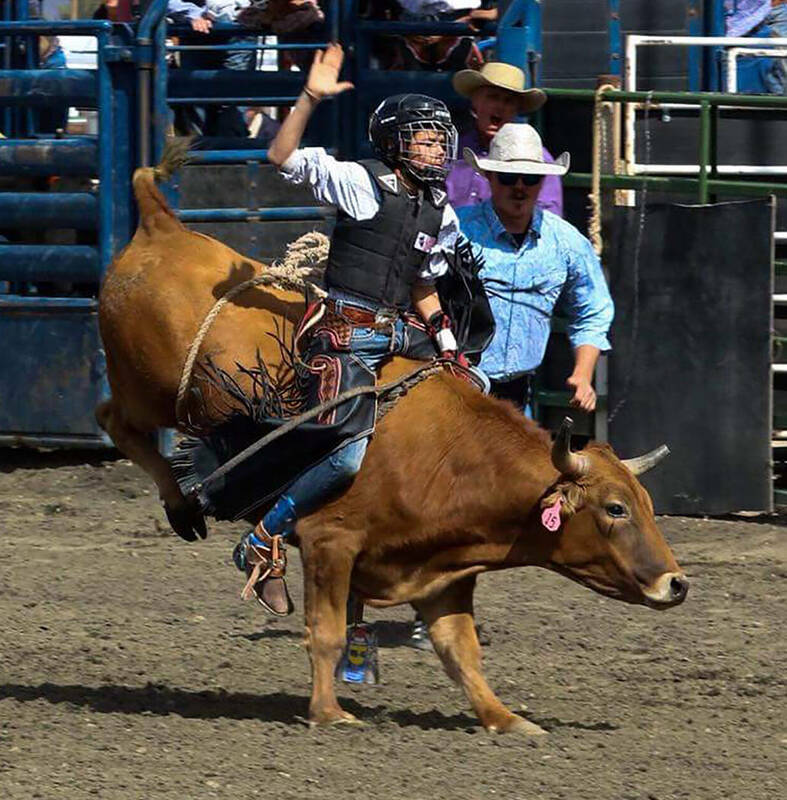 Buddy Krebs/Special to the Pahrump Valley Times Pahrump sixth-grader Brandon Mountz finished second in bull riding at a rodeo in Elko and is currently in third place in the state among junior high school competitors. Buddy Krebs/Special to the Pahrump Valley Times Pahrump senior Tye Hardy, who qualified for nationals a year ago, leads Nevada high school bull riders after he won the event at a Sept. 8 rodeo in Battle Mountain. A year after then-junior Tye Hardy qualified for the national championships, he and a much younger competitor appear destined to make that trip next summer. Hardy sits in first place in the state among high school bull riders; in fact, he’s the only bull rider to have any success at all after rodeos in Ely, Battle Mountain and Elko. Hardy netted 20 total points Sept. 8 in Battle Mountain to take the season points lead. But there is a new name from Pahrump on the state event leaders’ list. 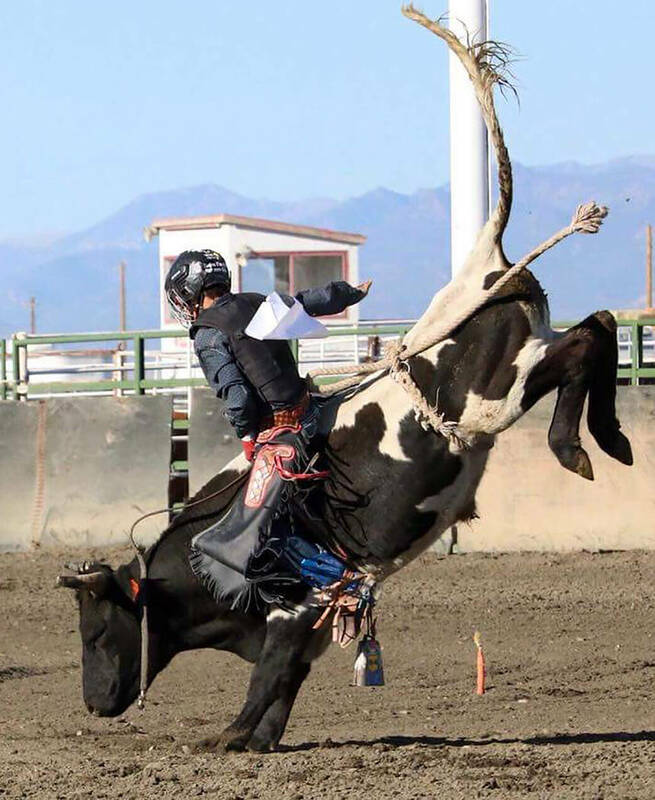 “Brandon Mountz won the junior high bull riding the first day, and he got second overall for the Elko rodeo,” Pahrump Valley High School rodeo director Buddy Krebs said. The sixth-grader scored 19 points in Elko over the weekend, and those 19 points are good enough for third place overall among junior high school competitors in the state this year. Mountz trails Brenden Webb of Washoe County, who leads with 49 points, and Elko County’s Zach Oros, who has 20. Right behind Mountz are Timothy Toops and Charlie Wright of Elko County, with 18 points apiece. “As things stand now, Brandon and Tye already have qualified for nationals this year,” Krebs said. Krebs said there are 15 members of the rodeo club, and more are always welcome. There are three more rodeos scheduled for this calendar year, then eight from February until May. The state finals will be May 24-28 in Las Vegas. The next rodeo on the calendar is this weekend in Spanish Springs.